Fresh ripe peaches are truly one of the best parts of summer. The window is short; enjoy peaches as often as you can, and in as many ways as you can! Definitely include peach cobbler a couple of times before the season is over. 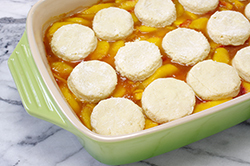 There are many types of cobbler – some cake-like, others with a more biscuit-like character. 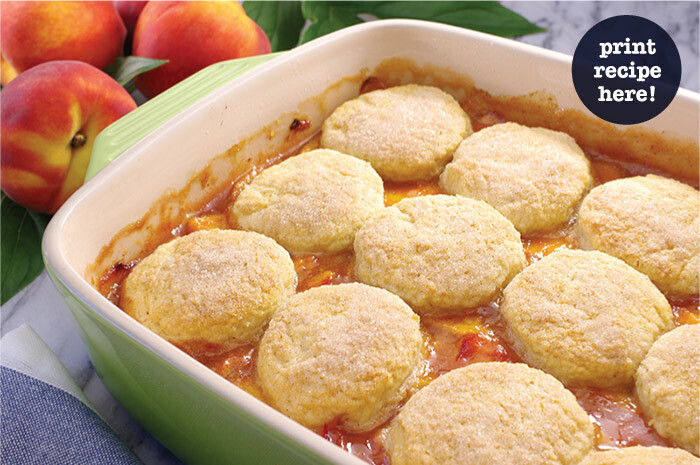 This time around, we’re featuring a fabulous peach cobbler with a biscuit-type topping. Slightly sweetened biscuits bake atop a pan of bubbling peach wedges. The only thing left to do is scoop your favorite vanilla ice cream on top! 1. Preheat the oven to 425°F. Prepare a ceramic baking dish (about a 2-quart capacity) by lightly buttering the interior. 2. 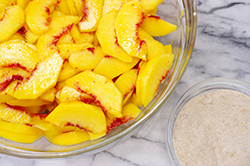 Prepare the peaches by peeling, pitting, and slicing into thin, crescent-shaped slices. Toss with the lemon juice. 3. In a small bowl, toss together the white sugar, brown sugar, cornstarch, cinnamon, and salt. 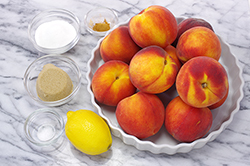 Add the mixture to the prepared peaches, and toss to combine. 4. 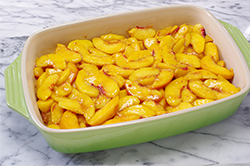 Place the peaches in the prepared baking dish and place in the oven for 20 minutes to jumpstart the baking process. 5. 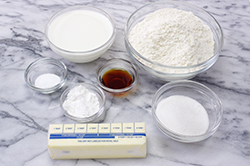 Meanwhile, in a large mixing bowl, mix together the flour, sugar, baking powder, and salt. Stir to evenly combine the ingredients. 6. 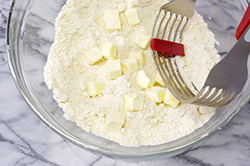 Add half of the diced butter to the flour mixture and combine well with a pastry blender or fork. Add the remaining diced butter and continue to blend leaving pea-sized pieces of butter. 7. Add the vanilla extract to the milk. 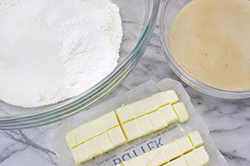 Add the milk mixture to the flour-butter mixture, and stir together until a rough dough is formed. 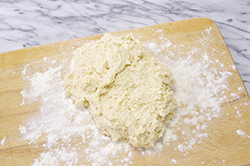 Turn out the dough onto a lightly floured board and gather the dough together. Knead 2-3 times to form a dough ball. Flatten the dough ball to about a 1/2-inch thickness. 8. 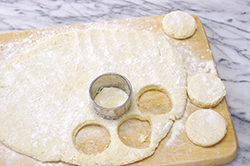 Using a 2-inch biscuit cutter, cut circles of dough. Place each round on top of the hot peaches in the baking dish. Brush the tops of each dough piece with melted butter. 9. In a small bowl, stir together the sugar-cinnamon topping. Sprinkle the entire top of the baking dish with the mixture. 10. Continue baking in a 425°F oven until the biscuit dough is cooked through and the tops nicely golden brown, about 15 more minutes. Remove from the oven and allow to cool for 30 minutes. 11. Serve warm (not hot) with freshly whipped cream, or your favorite vanilla ice cream.